I have no picture for my recipe for this week. I got all involved with cooking yesterday and took no pictures of food. Shame on me. Mix together the butter, salt, Accent, sage, and pepper. Set aside. Combine bread, milk, celery, and onion in a large bowl. Lightly toss with seasoned butter. Spoon it into a casserole dish and bake at 350 for 20-30 minutes. 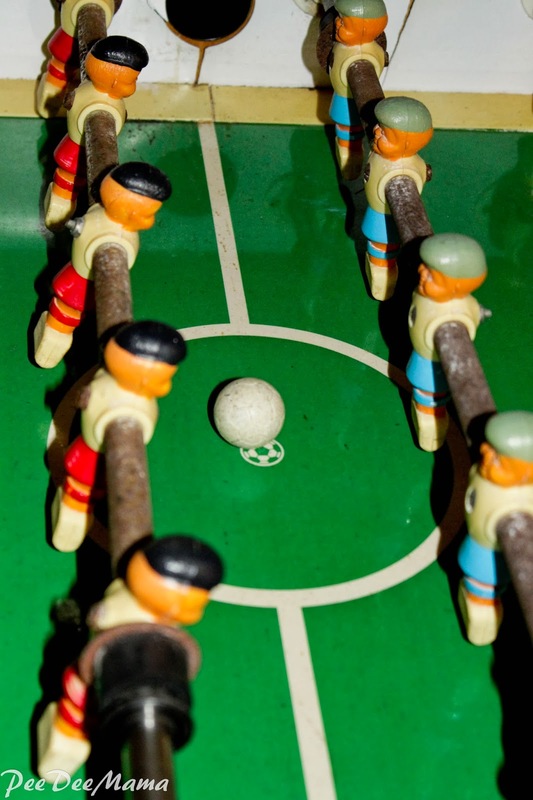 We were gifted with a Foosball table last year. The small people have a good time playing it, and it's a source of easy entertainment when friends come over. Eating turkey, dressing, pumpkin pie. Watching the Macy's Parade. Spending time with family. Watching football. All of these are traditions for Thanksgiving Day at my house. All of these are good things. There's nothing inherently bad about eating, watching a parade or football game, or spending time with family. This year, though, it doesn't feel like enough. Because it isn't. Nowhere in that list of traditions is stopping to BE THANKFUL. Sure, we give thanks as we sit down for the big meal. We even go around the table saying what each of us is really thankful for. But this year I want to do more. I plan to do more, to spend more time being thankful. Not just on this Thursday, but every day. To be thankful for the huge mountain of laundry that needs to be washed and folded - We have clothes. To be thankful for the early mornings, crazy hectic school days, and even crazier and more hectic afternoons running around to various activities - We have been blessed to be able to homeschool and to have the opportunity to participate in those activities. To be thankful for the pile of dishes waiting in the sink to be washed - We have food. To be thankful for the high noise level in my house - My children are healthy and able to run around and make noise. To be thankful for the large amount of money paid at the gas station - We have vehicles that get us where we need to go. I've been quiet here lately. 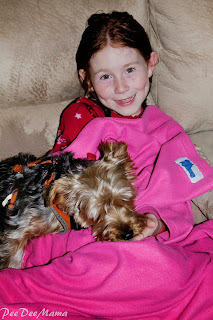 Of course I've shared snippets of life via Wordless Wednesday and recipes via Food on Friday. But overall, I've been quiet. It's not that I don't have thoughts to share. I do. They roll around in my brain all day long, every day. Maybe that's the problem. There are so many thoughts rolling around that they crash into each other, creating chaos in my brain. Yep, chaos. Utter craziness. I've been struggling with watching my small people grow up. The Boy is now a teenager. While we do sometimes have to deal with teenage attitude, for the most part I'm really enjoying this phase of his life - except for the whole "he's growing up WAY too fast" part. As the youngest of the small people, Sassy will always be my baby. But when I look at her, I realize she's no longer a baby. She's a little girl. She lost her first tooth a couple months ago and has a 2nd one about to fall out. She's reading really well now too. In just a few years (fewer than I want to think about), she'll be the only one left here when the others graduate and go off to school. Speaking of years, this year is just flying by. It seems like just yesterday I was making out my list of goals for 2013. Now I'm getting ready to start my list for 2014, knowing that I didn't even get to most of the ones for this year. I don't know if I should be disappointed with myself for not meeting the goals, or just start looking forward to starting over. Although, now that I think about it, why do I have to wait until January 1st to start over? I can start new today. I can refocus my life - my brain - today. So that's where I am. Deciding that I need a new focus. These Bar-B-Q Cups are great for a hot lunch. I made 2x the amount of filling, used half, and put the other half in the freezer to use another time. 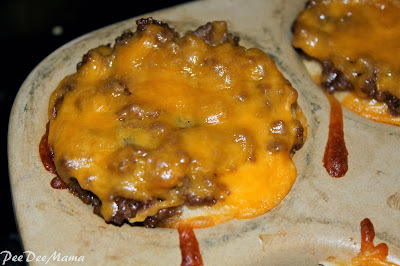 Combine ground beef, barbecue sauce, onion, and brown sugar. Set aside. Separate biscuit dough into 12 biscuits. Press each one into bottom and sides of a muffin cup. Spoon meat mixture into biscuit cups. Sprinkle with cheese. Bake at 375 for 12 minutes or until golden brown. 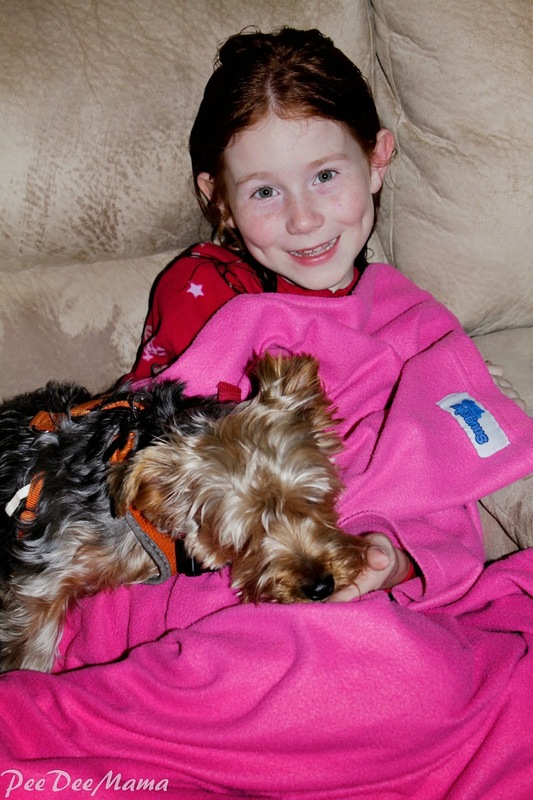 Now that it's getting cooler here, Little Red enjoys getting all snuggly with Buddy. Do you have a wordless (or not-so wordless) post you want to share? Link up below. I'm always excited to find a way to get my small people to eat their veggies. They absolutely LOVE these green beans. Melt butter in a large skillet over medium heat. 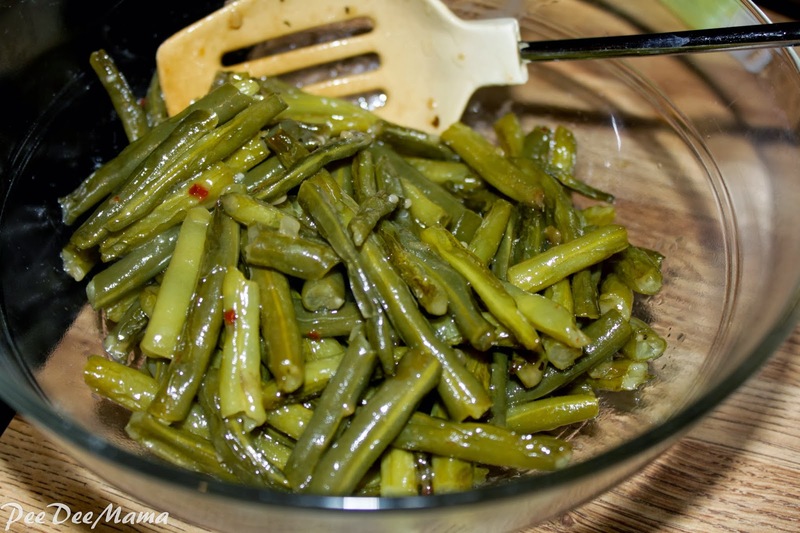 Stir in green beans and Italian dressing. Cover and cook for 25 minutes, stirring often. Uncover and cook until beans are tender. 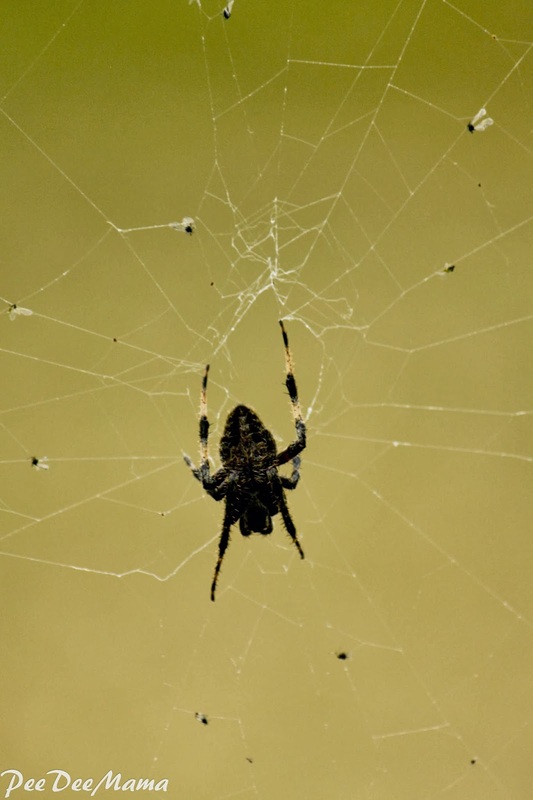 This guy had spun a web across the gate of the fence going in to Soccer Girl's practice field. Do you have a Wordless (or almost Wordless) post to share? Link up below. This has been a crazy busy week. Because of the time change, soccer practice for the small people was moved up to an earlier time, which then interfered with ballet class times, or had us going straight from practice pick-up to another activity with no time for me to actually cook. So I'm pulling a recipe from the archives this week. Sift together (or whisk in small bowl) flour, salt, baking soda, cinnamon, nutmeg, clove and ginger together and set aside. Beat butter, brown sugar and sugar together in a large mixer bowl. Add pumpkin and vanilla and mix until incorporated. Add egg and beat well until fully incorporated. Drop rounded spoonfuls onto baking sheets lined with parchment paper. Bake for 13-15 minutes until edges start to brown. Remove from oven and let sit on hot baking sheet for 2 more minutes. Move cookies to wire rack to cool completely. I had a 29oz. 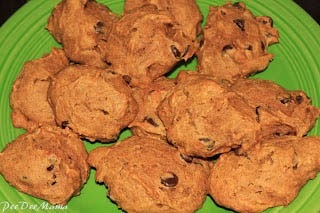 can of pumpkin, so we doubled the recipe and ended up with about 5-6 dozen cookies. Disclosure of Material Connection: I received this movie for free in the hope that I would mention it on my blog. Regardless, I only recommend products or services I use personally and believe will be good for my readers. I am disclosing this in accordance with the Federal Trade Commission's 16 CFR, Part 255: "Guides Concerning the Use of Endorsements and Testimonials in Advertising." 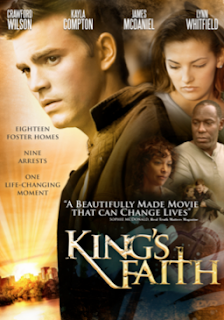 I recently was given the opportunity to review the movie King's Faith. The older small people and I all sat down to watch this together. King's Faith is about Brendan King, a young man whose troubled past includes multiple foster homes and arrests. After finding a relationship with Christ in his most recent incarceration, King begins his new life in his latest home with foster parents who are dealing with their own issues of grief. King's faith is challenged when his past catches up to him. This movie is great for pre-teens and teenagers. It gave us a wonderful opportunity to have great discussions about standing firm in our faith in the face of challenges. This film is rated PG-13 for violence, drug content, and thematic events, but it was just fine for the 10 and 13 year old's to watch. You can learn more about King's Faith by checking out the website, following on Facebook, or following on Twitter. Now for the best part, not only did I get to review King's Faith, but I get to offer a DVD to one of my readers. 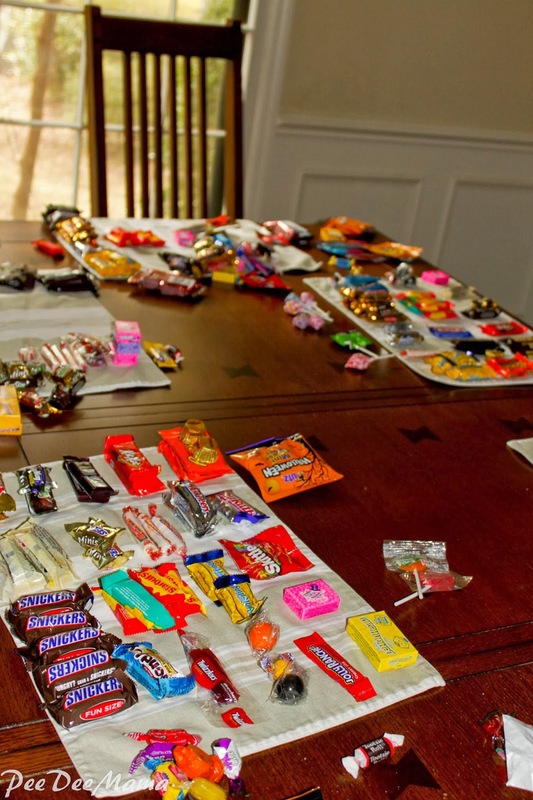 This is just a small portion of the "loot" my small people came home with from Trick or Treating last week. I was given the opportunity to check out another great children's book. I couldn't wait to check out Can't-Wait Willow! by Christy Ziglar. You can find Can't-Wait Willow! at Barnes & Noble and other fine retailers, as well as Ideals Books. In this age of instant gratification, this book is a great tool for teaching children the importance of patience and planning. Willow just can't say "no" to each good opportunity that comes up, but that leads her to miss out on the circus show that she had been really looking forward to. One of my favorite lines in the book is "sometimes you need to learn to say no to little things that are good to end up with a big thing that is truly great." How true that is!! It's a truth that people of all ages need to learn, not just children. This book would be a great Christmas gift for a child in your life! 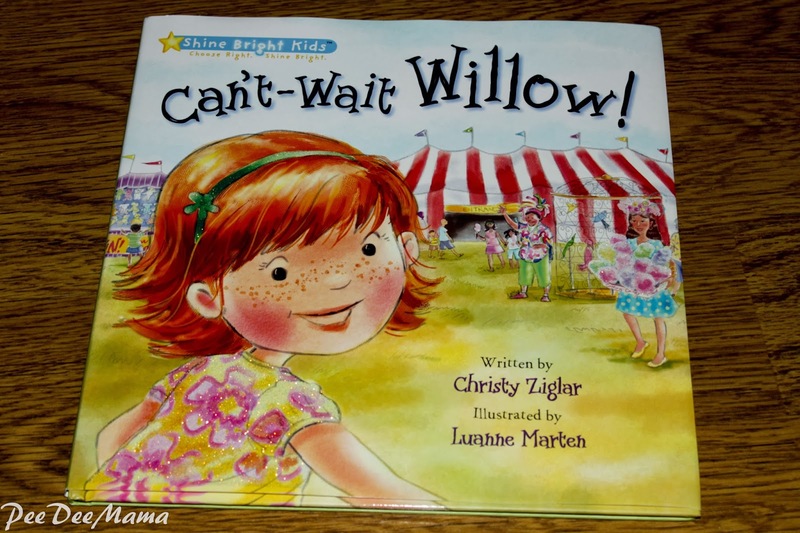 You can find more information about Shine Bright Kids and Can't-Wait Willow! on Facebook, Twitter, and the Shine Bright Kids webpage. Not only was I offered the opportunity to review this book, but I also get to offer a copy to one of my readers. Enter the giveaway below for the opportunity to win your own copy of the book Can't-Wait Willow! If you don't win the giveaway or if you "can't wait" to buy the book, you can get a copy here. These cookies were a hit when I made them last week! 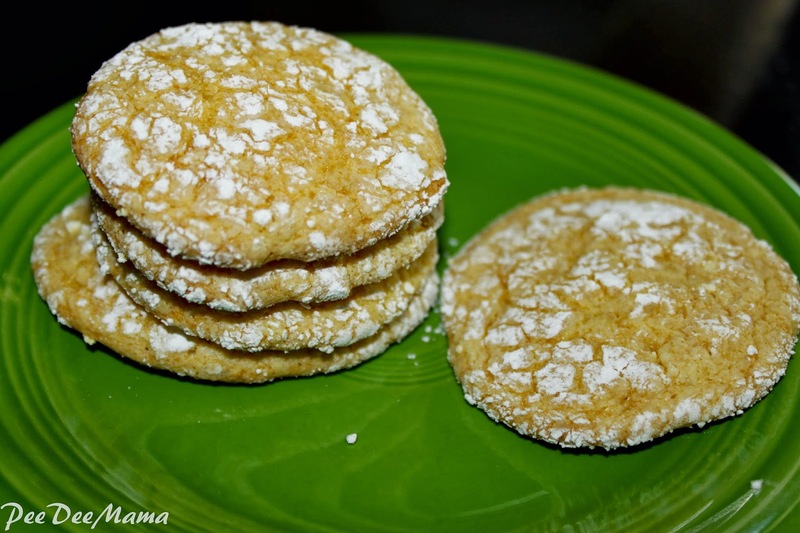 With only a few ingredients, they were fairly simple to make. The hardest part was trying to make the dough into balls since the dough is rather sticky. My hands were a mess, but it was definitely worth it! Mix together cake mix, cool whip, and egg until moistened. Cover with plastic wrap and refrigerate for 1 hour. (Dough will be sticky.) Make into balls. Roll in powdered sugar. Flatten with glass dipped in powdered sugar. Bake at 350 degrees for 10-15 minutes until lightly brown. When first out of the oven, cookies will be sticky so let them cool first on the pan.